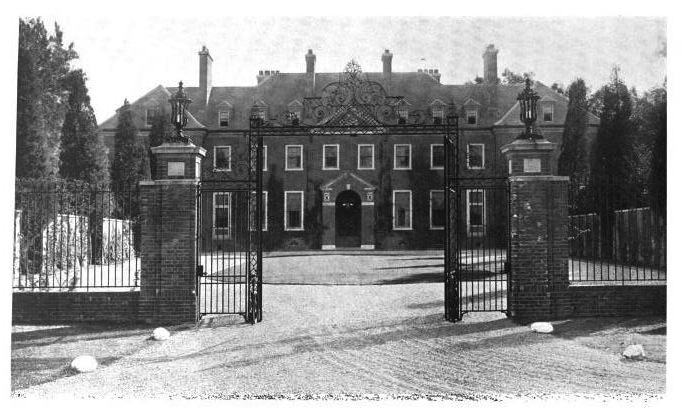 'Gateways', the William V.S. 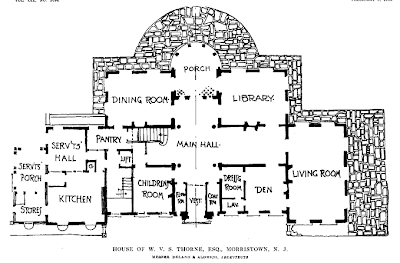 Thorne estate designed by Delano & Aldrich c. 1910 in Morristown, New Jersey. 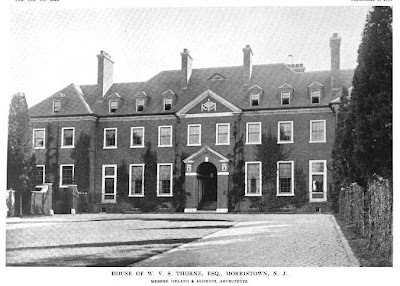 Thorne was president of the Delaware Valley and Kingston Railway. Click HERE to see 'Gateways' on bing. Photos from American Architect & Architecture, 1916. Surprised to see this home pretty much untouched..except for the gardens of course. Seems way to many cars for a single household, is this some sort of public building now? Also, is this the same Thorne family that resided in Islip? I was going to comment what a beautiful, well proportioned home but what on earth did they tack onto the rear and what did they hollow out where the new appendage meets the old home. Then I took a look via Bing 2 houses to the west on Normandy Road and saw an old home being swallowed whole by a mismatched jumble of ever growing manufacturing? laboratory? or industrial additions. What a hot mess at the end of the road, they should have just put that home out of its misery and tore it down. There must be crazy zoning in Morristown to let some of that get built. I just noticed the beautiful entrance gate is gone...what a shame. Not Delano & Aldrich's best work. And the front portico is outright clumsy. 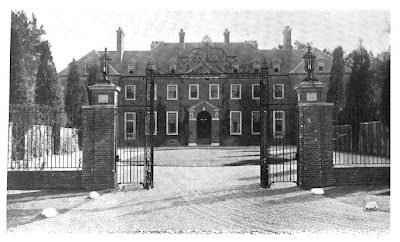 a couple of thoughts, the gates are still there , just have to look very closely at the picture from the front. 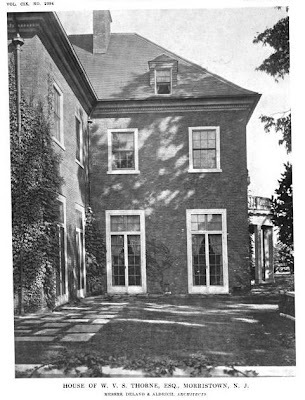 secondly the house is currently ( and has been since i was a boy ) the home of the Unitarian Fellowship in Morristown nj. that is the reason for the ackward addition on the back. for all of you picture viewers behind and to the right on columbia parkway are two very grand carraige houses, the one on the left of the two is a very famous jigsaw puzzle. HPHS and DED can put names to those former estates. Ancient---definitely not their best work, but it interests one nevertheless...the design inspiration seems to be Dutch manor house, unusually enough. It may even reference, portico and all, some original. Wheatley--an imaginative, impressionistic work, highly artistic in conception, with endless references to other places and times imaginatively re-worked into a fascinating whole. Pembroke, a great big ole f-you wedding cake plopped down on its site. Xanadu indeed. Very different sensibilities at work, both houses compelling statements about wealth and leisure and the messages its owners wished to convey. One turns quietly inward, the other thumps its chest. For all its size, Wheatley has domestic leanings, and is designed for civilized family life. Pembroke is designed to re-assure its owner that he was who he was. Three cheers for wedding cakes!!!! The previously mentioned Otto Kahn estate, The Cedars, located in Morristown had a great deal to do with the survival of Oheka, built later on LI. When a fire swept through the NJ mansion destroying priceless antiques and art, supposedly Otto Kahn vowed never to let that happen again. I believe he was quoted as saying he only was a temporary owner of such treasures and he felt responsible for their loss at his New Jersey estate. He then built Oheka to such a standard, a virtual concrete bunker, that although vandals set numerous fires inside the home when it was abandoned, even gutting one room completely, they never succeeded in burning the massive structure down. It is virtually fire proof. 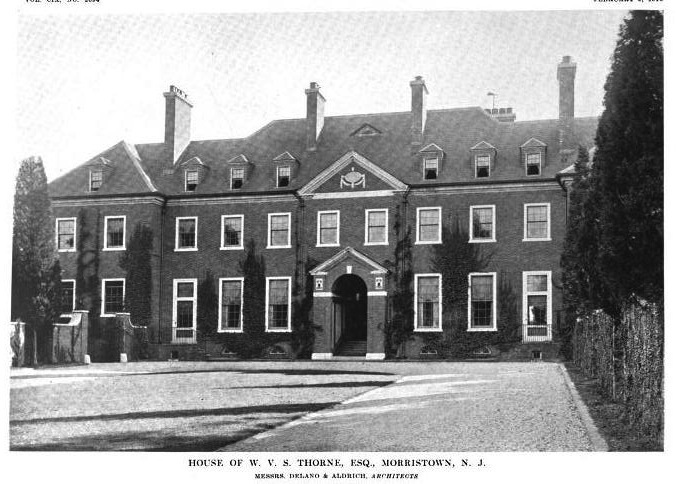 There were many beautiful estates in Morristown. Unfortunately, by the early 1970s, most of them were razed. Ugly office buildings were built in their place, especially across the street from the hospital. Oh. Oops. I had both wonderful Zach blogs open. The Pembroke comment here was supposed to be actually on the Pembroke post on OLI. So...is this Thorne the same Thorne that resided in Islip, Long Island? William V.S.Thorne was acturally a railroad man. He was an officer of several railroads over the years. when I moved to Morriston in 1953 to weathervane over the carrage house was a railroad engine. It has since disappeared. This is currently used as a meeting house for various institutions. 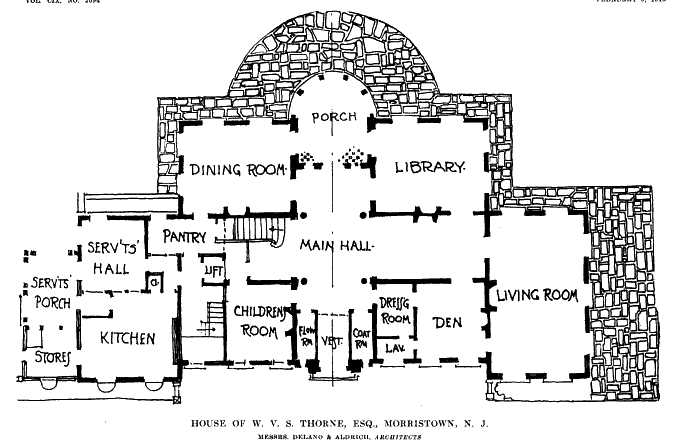 The massive house referred to at the end of the street is the Morris Museum, design by McKim, Mead, and White. The museum was expanded and ruined the integrity of the home. The hot mess archibuff refers to,is the former,headquarters of Alllied Signal/Chemical and now Honeywell. 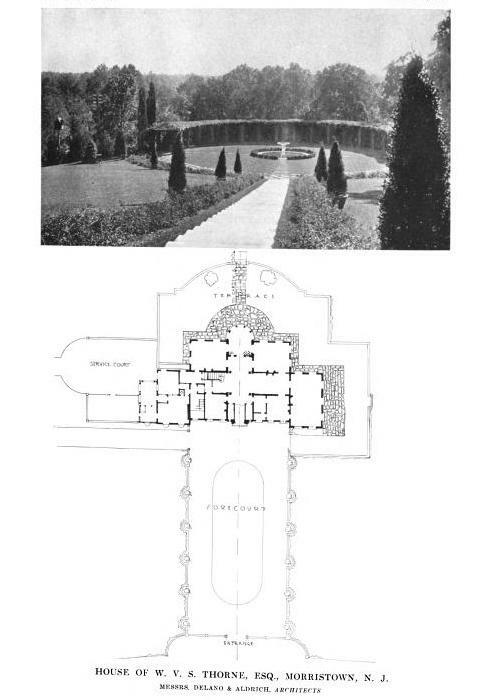 It is the grounds of the old Otto Kahn estate Cedar Court that was a gift from his father in law when he married. There were over 100 millionaires in the area at that time including Geraldine Rockafeller Dodge and her estate Giralda Farms and the huge McKim Mead and White designed Florham of Vanderblt Twombly fame mentioned elsewhere in this blog. 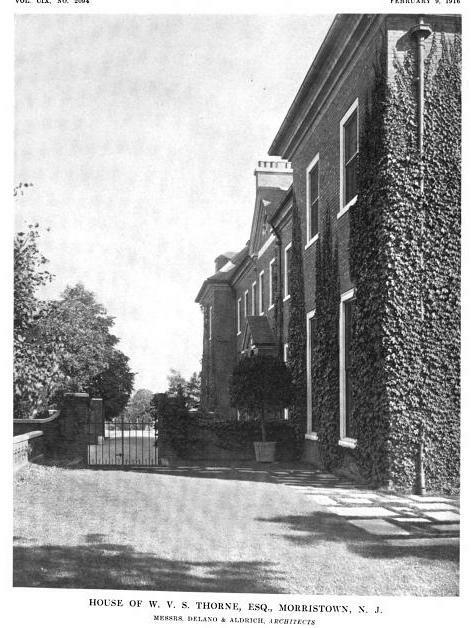 The 32,000 sq feet Glenallyn a Tudor pile designed by Berg was just the show home fundraiser for Morristown hosp. Last May that was my chance to tour it. There is a lot lost in the area but still some to see.